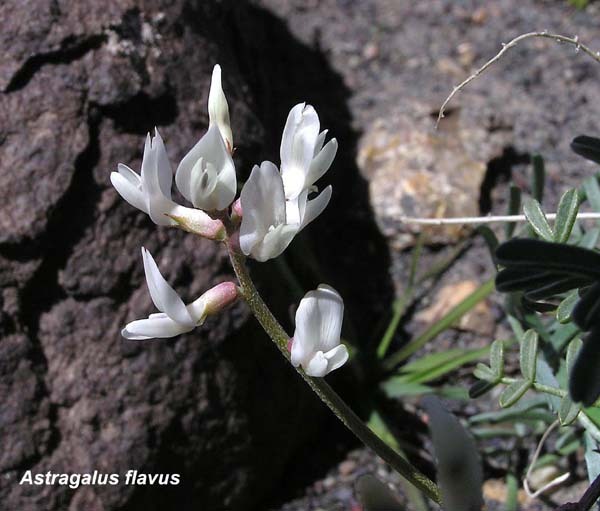 The greenish-white, long, sprawling leaflets of Astragalus flavus are topped by numerous flowers on long, upright, leafless stems (although stems can be bent or arched, especially as they begin to grow). Flowers are usually yellow, but in the Four Corners area, they are often pure white. ("Flav" is Latin for "yellow".) A. flavus often grows in Selenium soils. Thomas Nuttall, famed Professor, collector, and taxonomist, collected the first specimen of this plant in the Rockies in the mid-1830s and published the description in 1838.